DLR Group was engaged by financial technology company BlackLine to design their new headquarters located in Los Angeles, California. Rapidly expanding financial technology company BlackLine wanted a dynamic new home to reflect its open culture and support future growth in the Greater Los Angeles area. 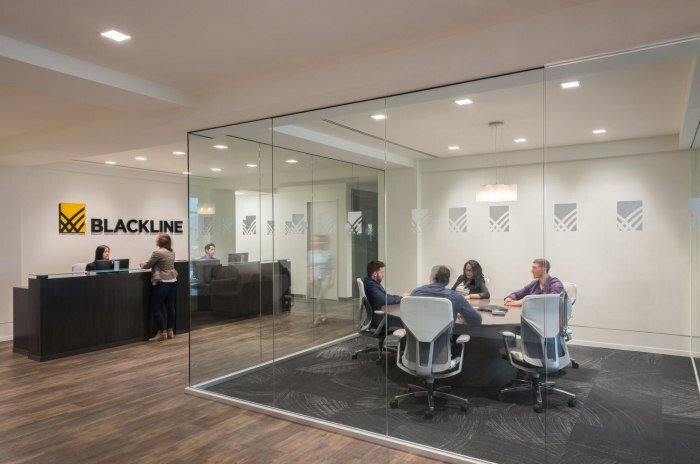 This design project comprised phased, occupied tenant improvements to 65,000 square feet of office across three floors for the headquarters of BlackLine System’s 450 employees. The program includes private offices, open work stations, small and large conference rooms, informal lounge and collaboration spaces, a game room, a music room, quiet pods, training areas, and a kitchen. The challenge of keeping employees connected across multiple floors is solved through an open, central stair dubbed the Heart. On the second floor, the Heart spills out onto an expansive, tech-enabled Recharge Zone. The Zone includes a music room, lounge seating, booths, a full-service kitchen, and a game area. Garage doors along the perimeter of the Zone support expansion into, or separation from, an adjacent multi-function training room with capacity of 120. On the third floor, a tree house is an open, airy conference room designed for informal collaboration. BlackLine’s brand colors of black and yellow are expressed in a sophisticated material palette boasting rich textures to reinforce the feeling of being as comfortable at work as at home. DLR Group provided architecture and interior design services on the project.